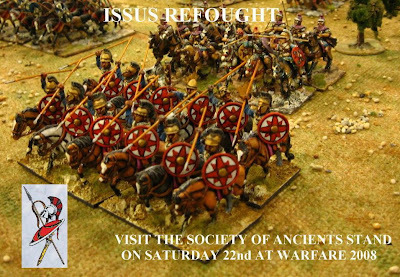 The Society of Ancients will be at Warfare this weekend. We will be presenting two games over the course of the event. On Saturday we will be refighting the battle of Issus using Philip Sabin’s Lost Battles. On Sunday we will be featuring a medieval encounter using Neil Thomas’s Ancient and Medieval Warfare. Both games will be large, 28mm, presentations and there will be opportunities to join in. We will also have a membership stand attached, where you can find out more about the Society of Ancients, browse recent issues of Slingshot etc. Membership of the Society of Ancients costs just £20 per annum, worldwide. We can now take subscriptions either for 2008 or 2009. As a special package available at Warfare, new members signing up at the show for 2008 can register for 2009 at the same time for a combined fee of just £30. You will get the first 5 issues of 2008 from the stand. This big discount is funded by the savings we make on postage, so, unfortunately, is only available in person, at shows.